Steelhead Alley or the Alley is located along the southern shore of Lake Erie stretching from Vermilion, Ohio all the way to Buffalo, New York. This fishery is unique in the fact that Lake Erie is the most heavily stocked Great Lake in regards to steelhead. The Alley's streams boast more steelhead per mile than any other watershed in the lower 48 states and Alaska included. The reason for the high numbers of fish is the aggressive stocking programs done by the three states of Pennsylvania, New York, and Ohio. 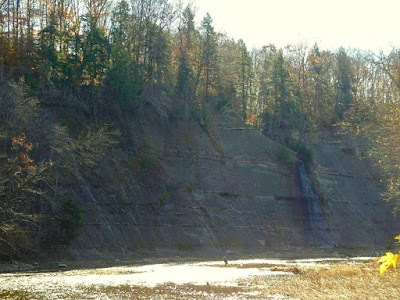 Streams along Steelhead Alley can range in size from New York’s mighty Cattaraugus Creek and Ohio’s Grand River to the many small creeks that run into Lake Erie. 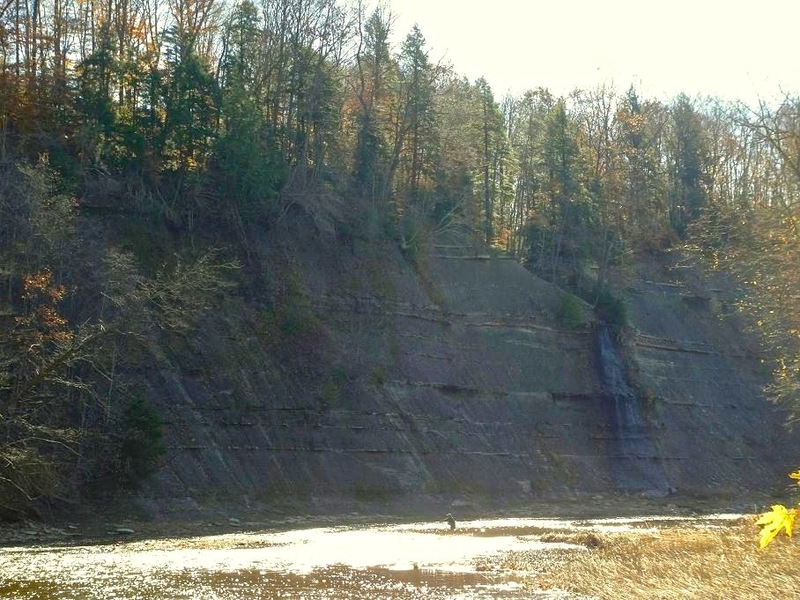 All of the tributaries are characterized that they run over shale bedrock and are usually shallow. Nearly all of them have little or no groundwater sources and rely on runoff from rain and snow melt. The surrounding terrain and access greatly varies. Some flow through rural areas and others flow through large urban areas such as Greater Cleveland, Ohio. 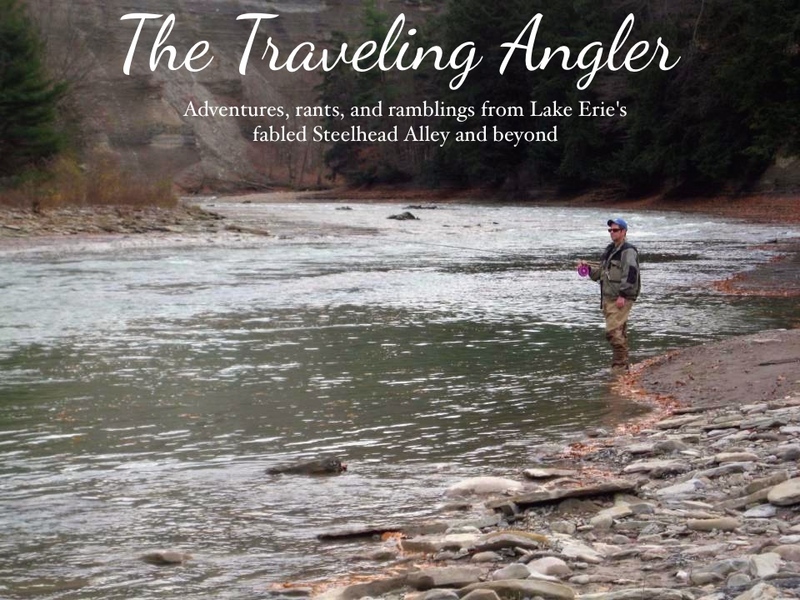 The Alley is the southernmost range for steelhead in North America and they’ve adapted well to Lake Erie. The fertile waters provide them with ample food and the warmer water temperatures fuel their growth. A couple years in the lake and they return as 3 to 4 pound fish. The three states Pennsylvania, Ohio, and New York combined stock over a million smolts into their respective tributaries. There has been cases of natural reproduction, but the numbers are too low to sustain a fishery. Once the smolts are enter the lake, they run the gauntlet of predators and many of them fall prey to them. Those that survive will enter the streams either in the fall or spring. For fall run fish, some will enter the lower sections of the streams in September and October. Spring run fish will come up in the months of March and April. The best times to fish are in the months of October thorough to December. The months of January and February can be hit or miss as in some years the winters are severe enough to freeze over the streams. Once spring arrives, many of the fish hit the gravel to spawn which is usually done in late March into April. Once spawning is done, steelhead start to head back to the lake. By late April into early May, there’s a few stragglers hanging around. By then the streams are far too warm for them. On average Lake Erie steelhead run about 4 to 6 pounds and any fish over 10 pounds is considered a trophy. Steelhead Alley’s streams are unique. They normally flow low and clear, and after receiving precipitation or melt off from snow most with the exception of the Cattaraugus and Grand have a very fast run off rate. All of them run over shale bedrock mixed in mud, gravel, rock, and sand areas. The angler can expect a wide variety as the streams will flow along high shale cliffs, clay banks and through riverine forests. Stream flow during post run off events consist of shallow runs, riffles, pools and pocket water. Pools of great depth and length are very rare and average 2 to 4 feet deep. Run off rates vary widely, depending on the size of each tributary watershed. 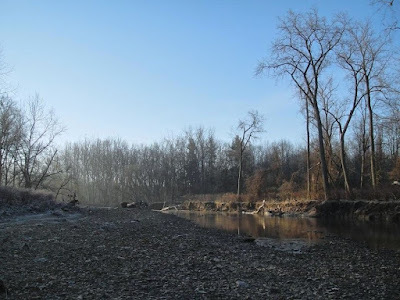 The Grand River in Ohio and Cattaraugus Creek in New York both have the largest drainage area of the Lake Erie streams. It’s not usually for these streams take 2 to 3 weeks to become fishable after run off. On average after run off most streams along the Alley will take 3 to 5 days to come down and the smallest of creeks it can be less than 24 hours. Due to the clearer conditions, Steelhead Alley anglers often use very long rods and light lines. The standard length rod can range from 9’ all the way to 15’. The longer rod allow for better line control. Longer rods absorb more energy when fighting fish with light lines as many anglers use 8 or 6 pound test. The majority of anglers will use fluorocarbon line as their main line and tippet. Presentations vary according to flow rates and clarity. When streams are running off color, many anglers will use spawn sacs that consist of salmon or trout eggs. Eggs have an advantage as fish can smell them without having to see them. As the water clears presentations are scaled back in size. Some anglers will go to single eggs or use small jigs. As for fly fishermen, they also employ long rods and leaders. 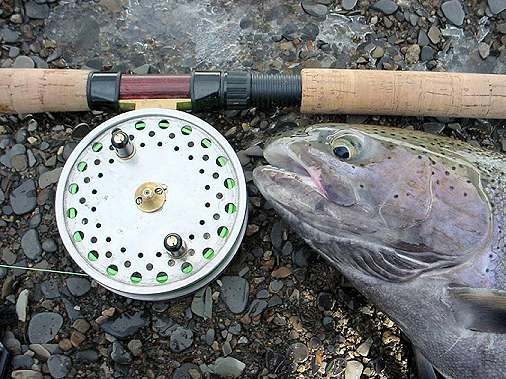 In recent years, some fly fishermen have started using spey or switch rods. During high water, they'll use large colorful streamers. As the water clears, they'll downsize and use either egg patterns or nymphs. Most of the streams have easy access as many urban and rural roads cross or run along them. However, many do flow through private property especially in Pennsylvania and New York. Anglers must get permission from landowners, however that’s become a problem in recent years as the popularity of the fishery has attracted many anglers. The majority of Ohio’s streams have public access as they flow through metro parks in Cuyahoga, Lorain, Lake, and Ashtabula Counties. The fishery has endured growing pains especially with access and the number of anglers. Over the years, the popularity has lead to an increase in anglers and some have routinely ignored landowner requests to stop fishing on their property. The result of that is more and more property has become posted. As public areas decrease that has lead to overcrowded conditions mostly in Pennsylvania. State agencies are buying or leasing property to help ease the congestion. Finding peace and quiet can be difficult, but the for the adventurous angler there can still be places that afford the solitude. Before there were steelhead, many anglers often stopped fishing in the late fall as the lake was too rough and cold to fish. Many of them were content to wait until spring. 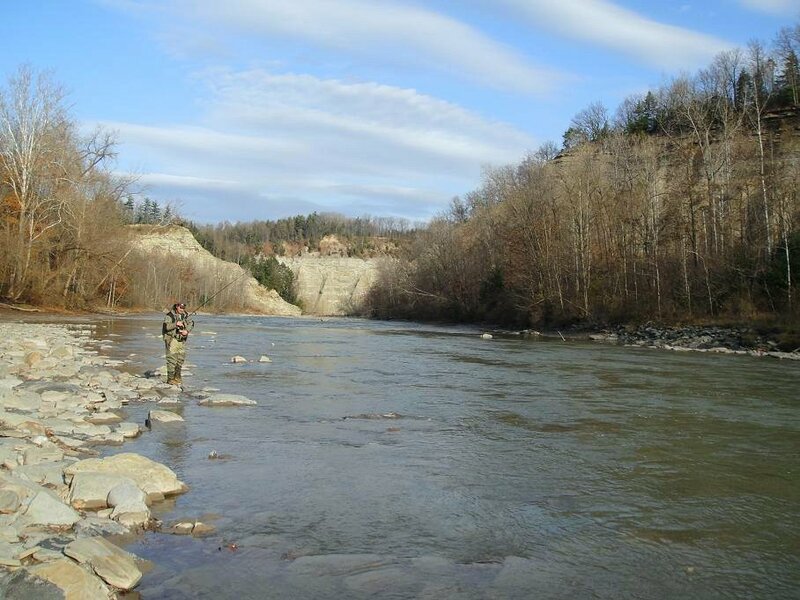 With the stocking of steelhead, the angler today has a fishery to fill that void. There's not to many places in the world where an angler can catch close to 50 fish in an outing inside an metropolitan area that has over 2 million people. Steelhead Alley is truly a remarkable place.